Many years ago, I was one of the three lucky kids from my school to have the honor of having the late maestro Teguh Santosa as our mentor for one day. Halfway through the day, Teguh asked us to draw something on the spot, directly using a drawing pen without any pencil sketch. 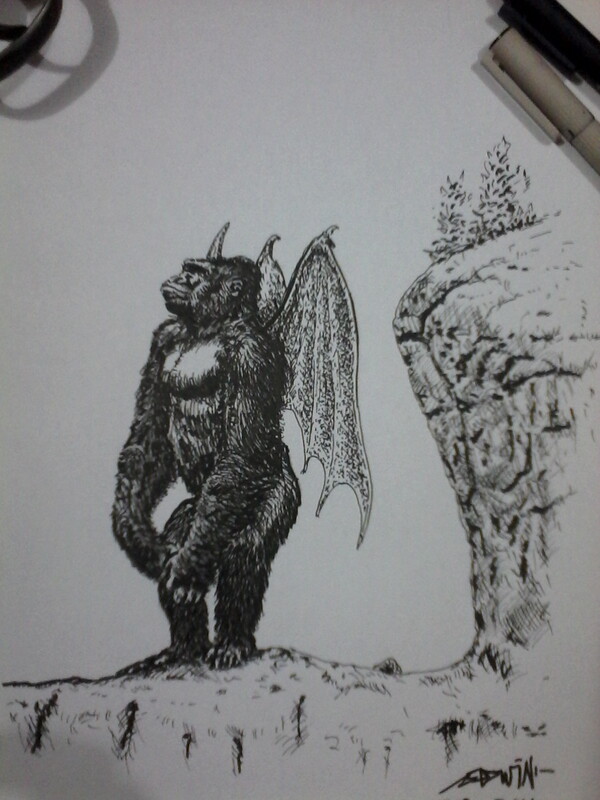 I drew a one-horned winged gorilla, and Teguh liked it so much that he asked me if he could keep it. I was flattered beyond words, of course. It was one of the happiest moments in my life, and I always cherish the memory. And I think it’s about time to share with you the creature I drew back then. As I recall, back then I drew it with a slightly different pose. Now I draw it standing and looking upward, as if ready to fly and prey on whatever creatures unlucky enough to be its prey. Trust me, you wouldn’t want to meet this creature in real life. Especially after dark. ~ by edwinlives4ever on October 13, 2014. I’m not satisfied with the wings. They should’ve been much larger. That creature wouldn’t be able to fly with a pair of wings that size. Yes, that comic maestro, the one born in Malang, 1942.